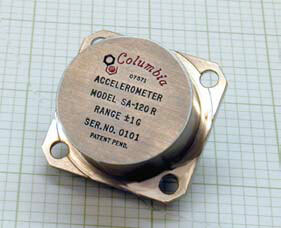 The Columbia Models SA-120R and SA-120RNP Force Balance Accelerometers have been designed as Measurement While Drilling (MWD) sensors for use in downhole well service applications. These sensors are completely self-contained and require no additional signal conditioning. The Models SA-120R and SA-120RNP Accelerometers are extremely rugged and will survive severe shock and vibration exposures. The Model SA-120RNP provides optimum accuracy and repeatability in high temperature environments up to +125 degrees C. Refer to Columbia Model SA-120RHT for extreme high temperature applications up to 200 degrees C. Consult the factory for customized versions of these sensors. 0.025% / Deg C Max.